DIX-HUIT MONTAGNES REGION, Côte d’Ivoire, Jul 9 2013 (IPS) - As the Côte d’Ivoire government clears its protected forests of illegal occupiers, particularly in the Dix-Huit Montagnes region, environmentalists say that this crucial move might lead to conflict in an already tense region. “I am in favour of evictions, but it should not be brutal. These are fragile populations,” Egnankou Wadja Mathieu, professor at the Felix Houphouet-Boigny University’s Department of Botany and director of the NGO SOS Foret, told IPS. In June, about 25,000 dwellers were violently evicted from the Niegre Forest in the Dix-Huit Montagnes region to the west of the country. Their settlements were destroyed with bulldozers. Such an aggressive operation was not possible in Mount Peko National Park, which lies 200 km north of Niegre. Mount Peko used to form a chain of mountains covered with luxuriant green forests. Over the last 20 years, however, illegal settlers – the vast majority of whom are non-Ivorian West African citizens – have cut down trees to grow cocoa, destroying almost 70 percent of the 34,000 hectares of protected forest. Illegal cocoa growers were lucky that this is an isolated reserve with narrow mud tracks that do not allow for heavy machinery or bulldozers. Still, an operation launched on May 18 shocked some inhabitants of Mount Peko. When Emmanuel Ouedrogo saw Ivorian security forces approaching, he fled. “We had to leave. We do not have the strength to fight back.” The Burkinabe is worried about his future. He already lost some of the crops in its field. “I will lose everything. I do not know where to go next,” he told IPS, his voice shaky. 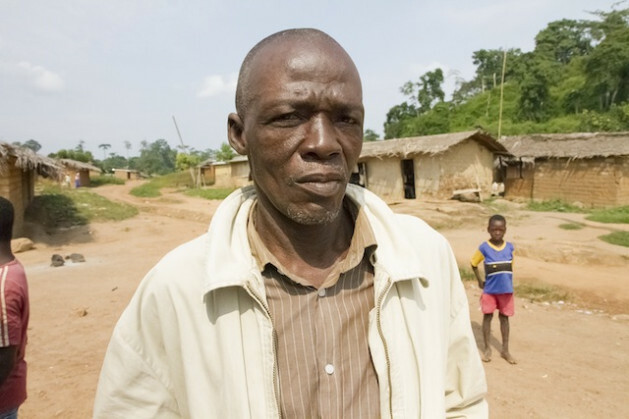 Ouedrogo Boureila, who has been living in Mount Peko since 2006, fled to Guézon-Tahouaké, a nearby village. “There was no violence when they launched operations. I left Mount Peko voluntarily,” he told IPS, adding that he will not return just yet. A number of natural forests have been degraded over the course of the years in this West African nation. According to the European Union, more than 75 percent of all Ivorian forests have now disappeared. “All classified forests will be rid of illegals. We have to stop the desert below the desert,” stated Mathieu Babaud Darret, Minister of Water and Forests, during a press conference on Jun. 13 to launch the voluntary partnership agreement between the EU and Côte d’Ivoire to stop illegal logging. “Deforestation has a great impact. The forests create a microclimate that allows cocoa to grow. If we cut the forests, cocoa production will fall. And this will also affect fauna, flora, and climate change,” said Mathieu. Cocoa contributes to 10 percent of the country’s GDP and 40 percent of its foreign exchange earnings. Mathieu said everyone, from forest rangers to local communities, was responsible for the degradation of the country’s forests. But the situation in Mount Peko is a complicated one. The security forces were largely in the national park to arrest militia leader Amade Oueremi for his role in the country’s 2010–2011 post-election violence. More than 3,000 people died in Côte d’Ivoire after former President Laurent Gbagbo refuse to concede victory to Alassane Ouattara and relinquish power after a contested poll in November 2010. Oueremi was said to have used the area as a base for more than 20 years and his heavily-armed lieutenants are still in the forest. Many believe that their expulsion could lead to more violence. The Authority for Disarmament, Demobilisation and Reintegration (ADDR), a governmental agency, is now registering all inhabitants of Mount Peko and disarming the militiamen among them. The government has told illegal forest dwellers that they can remain in the forest until the completion of this three-month registration operation, which will ultimately result in their relocation. There is no census on how many people will have to be relocated from Mount Peko, but local officials believe there are about 20,000 people living in the national park, which has been a protected area since 1968. “There is no land for agriculture in the region. This is why they settle in the forest,” explained Mathieu. The problem of lack of land and property titles has led to several violent clashes between native ethnic groups and foreign settlers who came from neighbouring countries to farm cocoa. Robert Kouhi Dje, the traditional chief of Guézon-Tahouaké fears the potential for violence. “The village feels insecure,” he told IPS. And the heavy military presence does not reassure him. Among the settlers are several militias who were active during violent conflicts here over the last decade, notably an attack against the western city of Duekoue where more than 300 were killed during the post-electoral crisis. Signs of rising tension are already appearing. A recent increase in road robbery and crime has led some locals to blame the Mount Peko squatters, but there is little proof so the blame game between the local communities and foreign settlers continues.